We know that club soccer isn’t cheap and it’s not a trivial expense for most families. At Cincy SC, we also don’t want our customers to feel like we’re nickel-and-diming them, so our fees include just about everything: 3 training sessions/week (usually), game and training uniforms, league and tourney fees, professional coaches, ref fees, and field and court rentals. Optional activities are offered occasionally for an additional cost. We’ve kept our fees flat for 3 consecutive years and they remain an excellent value compared with other area soccer clubs. For families with two or more players in the club for the full year, we offer a 5% multi-player discount on each player’s fees. Please note that roster deposits are typically not refundable. 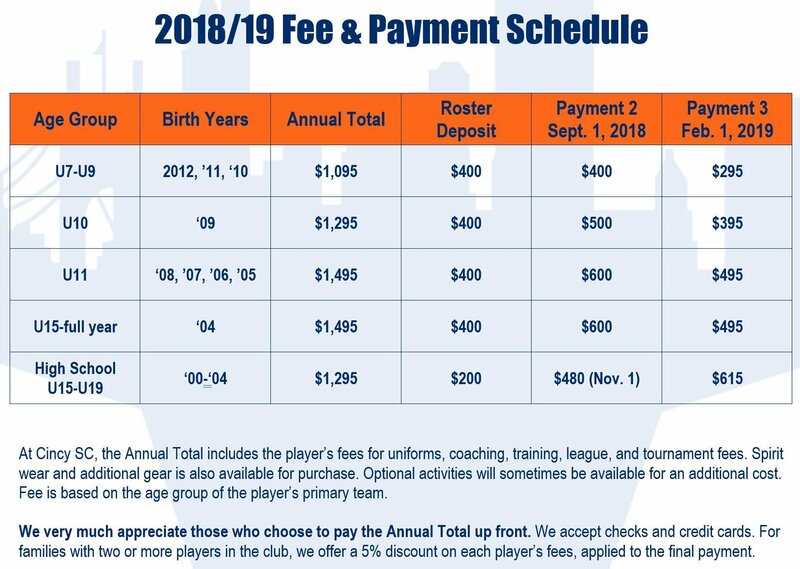 For players joining mid-year, fees are prorated and listed here.